Over the past 50 years or so there have been many great teams in the Pac-8/10/12, but only a few teams have risen to the top to dominate the conference over an extended time period. There are common threads among the teams that dominated and unique outliers as well. Coaching, a matter of “no small disturbance” in Oregon right now – to quote Acts 19:23 – plays a central role, as it involves recruiting, motivation, scheme and critical in-game decisions. But there are many other factors including players, facilities and injuries that have shaped the landscape of our conference’s rich history. Coach McKay and star running back, Anthony Davis. The Pac-8 began in 1968, and, coming off a National Championship in 1967, USC won the conference six out of the next 12 years through 1979, including three more National Championships. They went six of eight in Rose Bowl appearances. To be a USC fan in that decade must have been something special. This success was born of two great coaches, John McKay and John Robinson. McKay was head coach from 1960-1975 and his assistant Robinson took over when McKay left for the NFL. Those two coaches provided both the foundation for and continuity that resulted in a 20-year span (1960-1980) that included 12 conference championships, 8 Rose Bowl victories and 5 national championships. When Robinson left after the 1982 season, the combined record of McKay/Robinson was 194-54-10, for a winning percentage of 78 percent. Although coaching may be the foundation of dominance, the players have to make it happen on the field. USC players certainly had a significant role during this period, with four winning the Heisman Trophy: Mike Garrett, O.J. Simpson, Charles White and Marcus Allen. Marcus Allen took USC to another level. 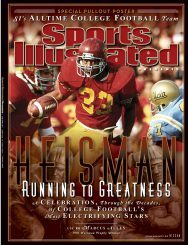 Beyond the Heisman, however, were a long list of dominant players during this period including: Sam “Bam” Cunningham (1970-72), who changed college football forever in helping USC destroy Alabama; Lynn Swann (1971-73), one of the all-time greatest college receivers; Anthony “A.D.” Davis, the first Pac-8 running back to have consecutive 1,000-yard seasons; Ricky Bell (1973-76), one of the leading rushers in USC history; Dennis Thurman (1974-77), an all-America safety, led USC and the Pac-8 in interceptions; Ronnie Lott (1977-80), one of the greatest defensive backs in USC history and many others. There were also great linemen, but those were purposefully not listed, in keeping with the tradition that linemen get no glory. The Pac-10 formed in 1978 and with it came more parity. 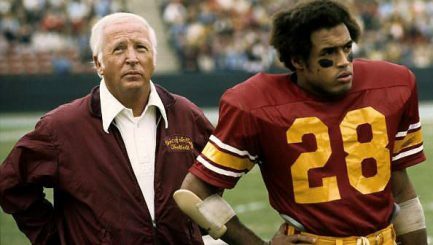 Between 1980 and 1989 USC won the conference four times, UCLA won four times, Washington twice, and Arizona State once (UCLA and USC were both 7-1 in 1987). In this case, the two LA teams were really co-dominators, though not getting anywhere close to what we saw in the previous two decades with USC. In addition, between 1979 and 1989 no Pac-10 team won a national championship, and the only Pac-10 Heisman winner was Allen, in 1981. 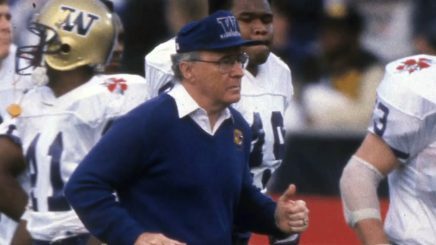 1990 saw the emergence of the Washington Huskies as a powerhouse, not just in the Pac-10 but nationally, sharing the national championship in 1991 with Miami. Dominance was short-lived however and largely left with Don James (1975-1992) who had a 153-57-2 record, a winning percentage of 73 percent. The Huskies won four Rose Bowls and one Orange Bowl during his tenure, and 22 straight games during the 1990-92 seasons. After James, the Huskies have been outright conference champions only two other times, in 1995 (albeit with a 7-4-1 overall record) and in 2000. Don James brought a share of a national championship to Seattle. The rest of the ’90s is a muddled mess when it comes time to assigning “dominance.” Multiple years had multiple teams sharing the conference title. Washington won the conference or shared the conference title four times. Stanford gets in there twice, UCLA three times, Arizona once, USC twice, Oregon once, Arizona State once, and Washington State once. 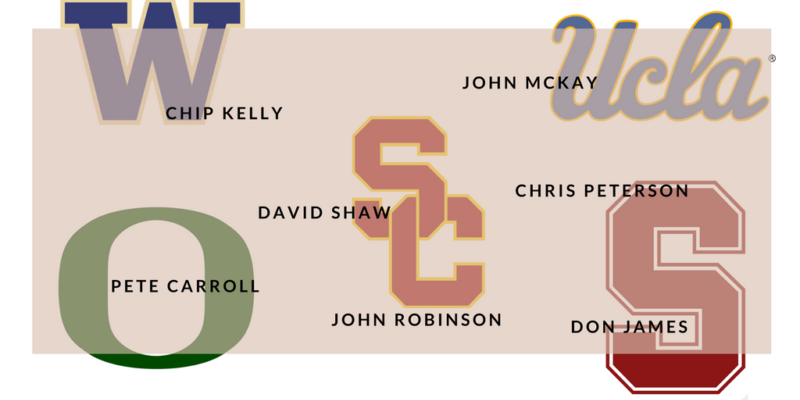 The 2000s largely belonged to USC again, with seven conference championships and two national championships. They won the Orange Bowl twice and the Rose Bowl four times. Their coach? Pete Carroll. Say what you like about the guy, but he was 83-18 from 2001-2009, a winning percentage of 82 percent! That’s better than James and McKay and even Robinson. His return to the NFL, however, led to the rise of two new powers in the Pac-12, two teams from the north that would rule all others. I’m talking, of course, about the Oregon Ducks and Stanford Cardinal. It really began in 2007, with the hiring of offensive coordinator Chip Kelly. That first year, with Dennis Dixon at the helm, the Ducks went 8-1 before Dixon went down with injuries, but finished 9-4 with a Sun Bowl victory. In 2008, Jeremiah Masoli took the Ducks to the Holiday Bowl and a win over Oklahoma State and a 10-3 record. In 2009, the Ducks dominated the Pac-10 (8-1), won the conference title by two games, and went to their first Rose Bowl since 1994. Although they lost to Ohio State, they ended the season 10-3. Their only Pac-10 loss was to Stanford, another team on the rise. 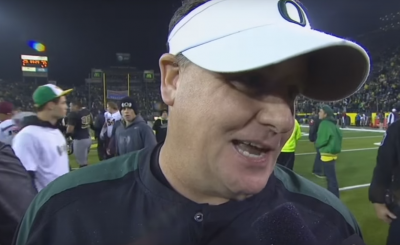 Chip Kelly was never afraid to speak his mind – or impose his will. The next stretch of Oregon football was like none other in Ducks history. Rose Bowl, National Title Game, Rose Bowl, Fiesta Bowl (four straight BCS games), Alamo Bowl, Rose Bowl, National Title Game. During that stretch the Ducks came within a field goal of winning the national championship in 2010, won the Rose Bowl against Wisconsin in 2011, beat Kansas State in the Fiesta Bowl 2012, and in 2014 beat Florida State (and the ‘Noles’ 29-game win streak that started in 2012) in the Rose Bowl, a 59-20 beat down of epic proportions. During this period, the Ducks were Pac-12 North Division champions four times, and conference champions four times. Since 2010, Stanford has also won the north four times (some years are shared) and over the past five years either Oregon or Stanford has won the Pac-12 Championship Game (Oregon twice, Stanford three times). What do all these dominant teams have in common? Coaching, plain and simple. A great coach is great in all aspects that are required to be dominant: recruiting, player development, system and scheme. But obviously that is not all that is required, for the great coaches described above weren’t dominate every year nor all the time. 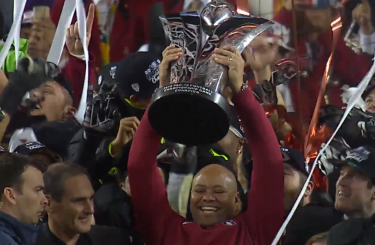 David Shaw has hoisted this trophy more than once, and probably will again. David Shaw is a great coach, but Stanford is struggling this year with just a 5-3 record. Why? Most point to the offense struggling without Kevin Hogan. Does that mean Shaw is a poor recruiter? Not necessarily. It probably just means that they’re going to struggle this year until the new quarterback gains the experience necessary to run the offense. In 2014, Mark Helfrich led Oregon to a 13-2 record, a win over Florida State in the first college football playoff, and back to the National Championship game. But he inherited a few notable things: Chip’s players, Chip’s system and scheme and Marcus Mariota. He also promoted Don Pellum to Defensive Coordinator, a disaster that was somewhat obscured by Oregon’s offensive dominance, and Florida State’s five turnovers. Where does the Pac-12 go from here? Who will be the next team to dominate the conference? Washington appears to be on the rise. They have a great coach and their defense has been great for several years. Now that it is matched by a great offense, they will likely be in the playoff this year, barring an unseemly and unlikely loss between now and then. They are clearly the best of the Pac-12 with no close second. Can Stanford get back to the Hogan years and challenge the Huskies? It’s certainly possible, as they have the coach, the recruiting, the system and the scheme. USC also appears headed in the right direction after some early ugly losses to Alabama and some middling foes, with a dynamic freshman quarterback and good defense. The jury is still out on Clay Helton, but promising signs are there. 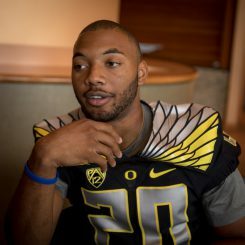 Oregon running back Tony Brooks-James. And what about Oregon? Many have written about our bright future with Justin Herbert, Tony-Brooks James, Troy Dye, Brenden Schooler, and an offensive line gaining experience. The weak link? The defensive line and linebackers. Of course the future is bright when you’re in a stygian black-hole night of five straight losses. I’m not convinced Helfrich is a great coach in the same league as the others on this page. The recruiting has been good but not great, the player development lacking and the timing of the switch to a new defensive scheme, well, ill-timed. Given all of these factors, I believe the Ducks won’t be in the hunt for the next cycle of dominance in the Pac-12. Clearly the most amazing facilities in the world aren’t enough to get them into the top 10 in recruiting. They will certainly be better, but probably not great, and I think the factors needed aren’t there to get the Ducks back to where they were during the 2010-2014 stretch. In all likelihood, the Ducks’ next cycle of dominance – if there is one – won’t take place until the 2020s, and it will probably be under the direction of a new coaching staff. I look forward to it, I hope for it, but I know it is rare and difficult to attain, as are great coaches. The comments below the articles have drawn raves from so many, and I do appreciate your emails about it. Be a part of it! If you check the rules, you will see that I protect everyone from the trolls. So, there is no downside! We want to hear from all readers on all the articles, so jump in Ducks, (as the water is fine) and be a part of this tremendous community!